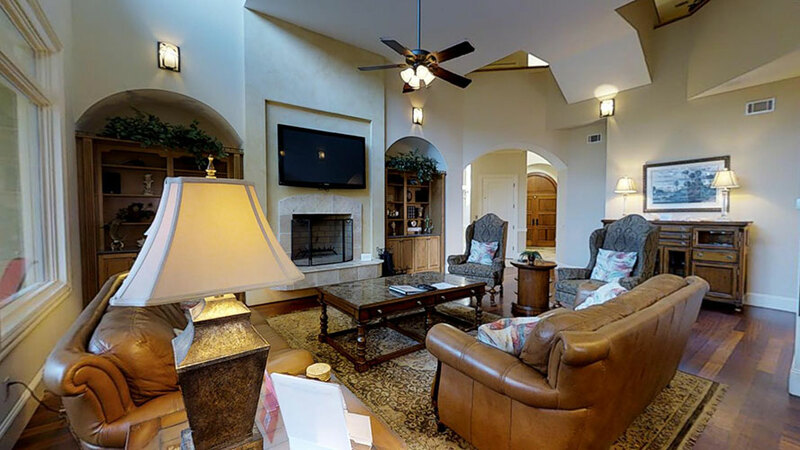 "Pelican's Perch" is a one-of-a-kind Tuscany style home with 7 bedrooms, 8 full baths and 2 half baths. Custom built in 2006 and located on a quiet cul de sac, this 6th row Chateau offers magnificence in architecture and interior design and is only a short walk to the pristine beaches of Hilton Head Island. Everything is impressive at Pelican's Perch, from the architecture the moment you enter the driveway, to the front entry, vaulted ceilings, chiseled tile and hardwood floors, custom lighting, cabinetry, built-ins and wall sconces. The home offers luxurious, yet comfortable furnishings and a floorplan that invites entertainment with theatre-style media room, screened lanai with pool, spa and covered outside summer kitchen, game room, elevator and 6-car drive-through garage. This 7 bedroom ocean-oriented home was built with luxury vacation living in mind. Nothing has been spared to make this the vacation that you will always remember. The main floor includes a living area with large flat-panel TV, formal dining room, gourmet kitchen with two dishwashers, eat-in breakfast area, master bedroom suite with king bed and two bedrooms with queen beds. 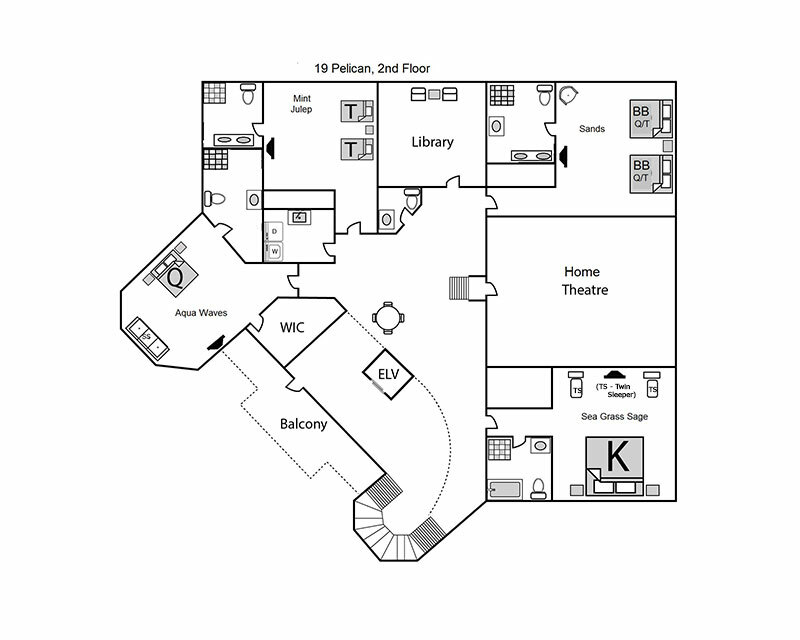 The second level features the theatre-style media room, office and four bedrooms with a king, queen, set of twin beds and set of bunk beds (Twin over Queen mattresses). All of the bedrooms on the main and second floors have flat-screen televisions and private bathrooms. For an extra fee, the library on this level can convert to extra bedding with a queen sleeper sofa. 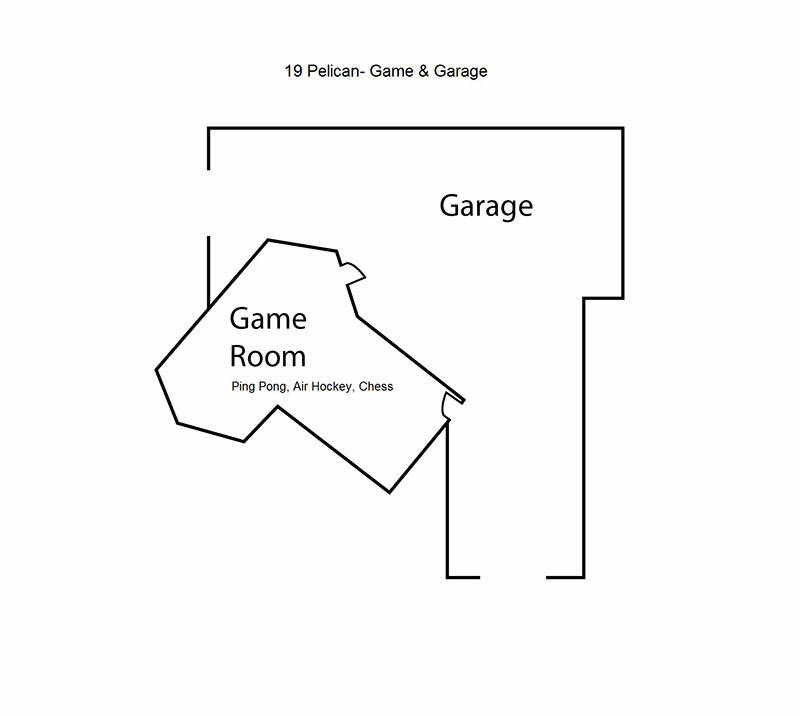 The garage level has a 6-car drive-through garage and a huge game room with ping pong table and mounted flat screen TV. This home also offers high-speed internet access. With well thought-out bedding, private insuite baths, 2 laundry rooms and numerous indoor and outdoor amenities, this home is perfect for your next family vacation, corporate retreat or special time with friends. Great house, well equipped and very comfortable. Worked great for our multi-generational gathering. Will book again next time the group is in Hilton Head. Destination Vacation was very responsive to our requests and good group of people to work with. This was our second time at 19 Pelican and we love the pool house and closeness to everything. DV responded quickly on some garage code issues but other than that we had no problems at all. Highy recommend DV and 19 Pelican for large families that want first class accommodations at Hilton Head. We rented Pelican's Perch. The house more than met our needs. Great media room, game room was ok, bedrooms, bathrooms, and kitchen were amazing. The pool also was great! We had a large group, and two dishwashers was helpful. We did feel that an extra refrigerator in the garage or game room and a free standing ice machine would have been very helpful - freezer and frig in the kitchen were full of food so - not much room for beer and extra bags of ice for coolers, extra milk, etc. There is a small wine cooler in the kitchen. We had a problem with the ice maker and the garage door, but Destination Vacation staff tried very hard to get things up and running for us in a timely manner. The staff was very helpful. All in all, our trip was amazing, the staff was great, and the house was awesome! Manager's Note: We are thrilled that you had an amazing week! We appreciate your comments and hope that you did find the under counter refrigerator useful in the outdoor kitchen, which is perfect for drinks and extra items. Thank you! Every request we made was met with quick and efficient service. This is the third time we have stayed in the same house. We felt like it was even better than the previous trip 2 years ago. We enjoy the proximity to the beach and access to bike paths to coligny. I think what we enjoy most is that our family can be together in one house. Overall the house more than met our needs and expectations. The house was lovely and spacious and very convenient to the beach. We especially enjoyed the hot tub. When we had questions, the Destination Vacation staff helped us out immediately. We had a wonderful time. We were very impressed and gratified with the caring and prompt response we had to a couple of minor issues. We had a great time and would definitely rent again through Destination. Pelican Perch is a wonderful home for a family vacation. We enjoyed the close proximity to the beach and privacy of our own pool. We had three little ones under two and it was a safe secure home for them. Each of my five children drove so having the roomy garage was perfect! If we can sing the rent we hope to return next May. I wanted to drop you a note and let you know that my entire family had a wonderful time in HH and they gave Pelican's Perch rave reviews! In fact, of all the homes we've rented (similar in size, appointments, and accoutrements), they ranked PP #1 as it accommodated us perfectly with private bedrooms and bathrooms and space in the dining room to comfortably seat all of the adults together. Also, we loved having the pool on the second floor as it helped us monitor the children and it gave us better safety and security. Thank you again for giving us a vacation that exceeded our expectations! "Amazing House - Perfect for Family Fun Times!" We stayed at this beautiful house, so close to the beach ( literally across a street) for a week. We enjoyed the stay thoroughly and would go back in a heartbeat. The house is super comfortable for large family, the owner has thought of every single detail from a large kitchen with more than adequate uetensils, cookware and spices to an indoor pool and hot tub and a steam room to a game room and theater, movies and games provided. The garrage also had small beach stuff like balls, kites, and other games. The outside of the house is as adorable and appealing as the indoor is inviting and comfy.Local markets and shops are less than a mile away. We even rented bikes and rode the bikes right on the beach! It is truly a gem of a find!!! "Perfect Home Away from Home"
Beautiful home in a beautiful location! The house is very well maintained, has latest amenities and is a short walking distiance from the beach. We had 3 families staying in it at the same time with ages ranging from 8 to 53 years old. Everyone found the comfort they wanted and things they needed to make it a memorable stay. A great value for the price! We would highly recommend it to our friends and family. "Very Relaxing, Spacious Home for Family and Friends"
This house was perfect for our needs and felt secluded/private but close to the beach. Everyone had a comfortable bed and privacy. The indoor and outdoor kitchen gave us a lot of options to cook at home and enjoy the heated pool. The house is clean and well maintained. This is a great house for a perfect vacation in Hilton Head. "Pelican's Perch is a Pleasure"
Pelican’s Perch is an unusually gorgeous rental – and spacious with many ‘get away’ places for the family to spread out. All seven bedrooms were painted a different color with the furniture and bedding matching the palette – cleverly decorated. The home theatre rocks! The chairs lay back and are so comfortable that you might fall asleep rather than watch that massive screen. The library with gas fireplace was so quiet and so nice – we were glad we didn’t have to have them convert it to an eighth sleeping room because it got a lot of use as a place to have some ‘me’ time. The game room was a godsend to get the kids downstairs and out of the way and the second story pool a really unique feature that we just loved. Being able to watch the kids from the kitchen or family room was a stress reliever. The outdoor kitchen was great, but the indoor one is truly gourmet – we used every spot in those double dishwashers at almost every meal. I’ve never seen a dining room table so big (made from an antique door). The beach set in the middle of the exotic landscaping was really unusual and so nice to have it fenced. The owner has obviously put a lot of time and effort into this rental. This is going to be ‘our’ rental for years to come. "Accommodates our Large Family Really Nicely"
This was the second time that we have enjoyed Pelicans Perch. 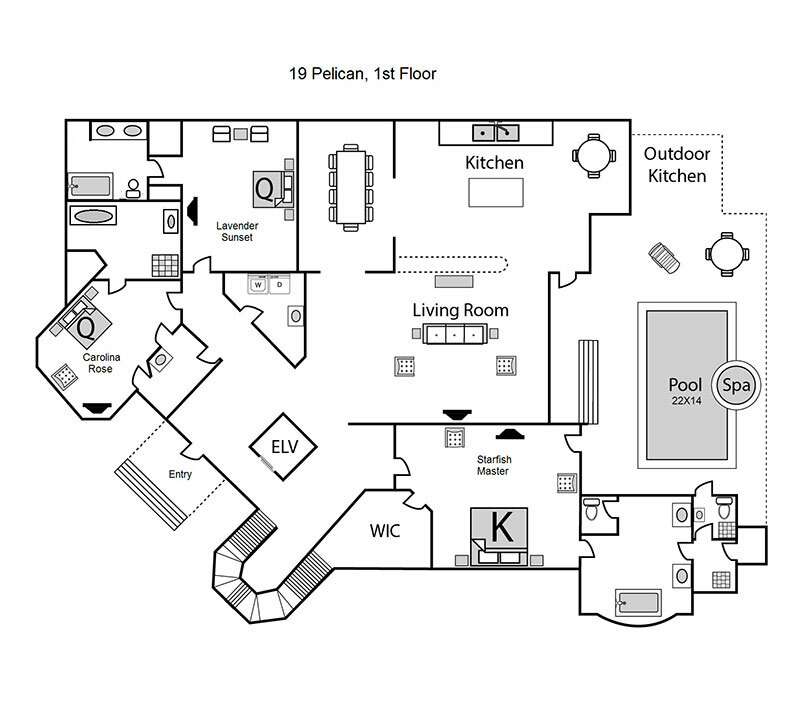 Our group consists of 6 different families and the bedroom configuration works perfect for us. The home is nicely appointed and the pool is great for the kids. We really have no complaints and plan on spending a week there in 2016. I have to say that our stay at Pelican Perch was the most relaxing time we've ever had in Hilton Head and we've been going there for years. When you first drive up to the house, you're overwhelmed with the beauty of the architecture and the landscaping. And then you open the impressive wood doors to the interior and again your overwhelmed with the space and the quality of the workmanship. I'm a builder so I know quality and this house has it. The wives were most impressed with the cleanliness of the house and wished their houses were as clean. The kitchen is massive and having five cooks in our group wasn't a problem. The kids as well as the adults spent endless hours in the pool area as well as in the game and theatre rooms. It's a fun house and we really enjoyed ourselves. I would unreservedly recommend this house to anyone planning a relaxing visit to HHI. "Attention to Detail Makes Pelican's Perch a Standout"
This was our 2nd time staying at Pelican's Perch, and it was just as wonderful as it was 2 years ago. To know that we would be staying at this lovely house again was a source of anticipation for our whole family. Kathleen is such a conscientious owner and pays attention to details. This house works perfectly for our family of 19, allowing plenty of space for families to have their own space as well as providing large areas for lots of time together. We prepared all but 2 of our dinners in the fabulous kitchen and used the outdoor grill daily. The well appointed kitchen with double dishwashers is such a pleasure to cook in. As long as the current owners own Pelican's Perch, it will continue to be our home away from home when we are at Hilton Head! "Accommodations our Large Family Really Nicely"
Very nice house. Spacious. Well maintained. Electronic door locks a bit cumbersome and elevator takes getting use to. Front porch lights were not working. Nice pool and BB area. Wonderful house for our family reunion. Destination Vacation was very quick to send someone out when we needed it. Well stocked kitchen. Would love to stay in this property again!